The union, which is asking for a £500 bonus, says bus workers are the only London transport workers not to receive an Olympics bonus payment. Unison says it expects 800,000 extra passengers to travel on buses during the Games. 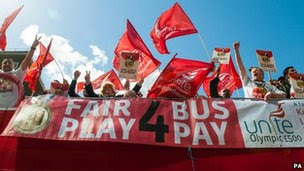 Peter Kavanagh, Unite regional secretary for London, said: "It's a disgrace that London's mayor, Boris Johnson, and the bus companies have allowed this dispute to get this far. "Our members are only asking for an extra £17 a day which will just about buy you a pint of beer and a portion of fish and chips at the Olympics.